Do you like FTL? Do you like Mario? Then according to Evan, you'll probably like Lovers in a Dangerous Spacetime, which comes out later today. This same-screen local co-op game has you pilot a brightly coloured spacecraft and gun down enemies all around you, but the FTL-meets-Mario part comes inside your ship. You can't pilot it alone, and even with two crew you're spread too thin, so you and your other crew member—either a second player or AI—must run from station to station to manage the systems effectively. In this video, which developer Asteroid Base released yesterday, you can see how that works in single player. Rather than a second humanoid crew member, you're joined by a very intelligent pet that you can direct to whatever station you need them at, either a space-cat as seen here or a space-dog "for those so inclined". What about those of us who defy convention and are neither cat people nor dog people? I need to make some new friends. 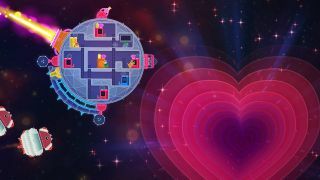 Lovers in a Dangerous Spacetime will be available on Steam at about 6pm today.